Supersaurus, Giants of the Jurassic! Gigantosaurus, Killer of the Cretaceous! Dromaeosauris, Fast, Ferocious Flesh-eaters! Packed with fascinating facts & action-filled stories, this book includes 16 pages of press-out dinosaur parts along with background scenes, so you can create your own amazing dinosaur battles. 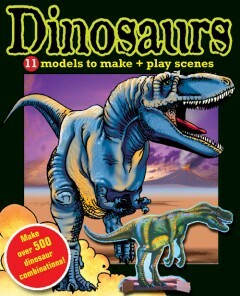 Makes over 500 combinations of dinosaur models!